GREEN BAY — A late-quarter scoring drive left the Packers to take a 24-17 lead into the fourth quarter of Sunday’s game against the Chargers. Early in the third quarter, Philip Rivers completed a 50-yard pass to Malcolm Floyd and the Chargers were at the Packers 36-yard line. Three plays later, a 14-yard toss to Keenan Allen put the ball at the 20. Two plays later, the Chargers tied the game at 17-17 when Rivers completed a 19-yard touchdown pass to tight end Ladarius Green, Clay Matthews in coverage. The drive went 79 yards in eight plays. The Packers began a drive at their 31-yard line with 3:34 to play in the quarter. Aaron Rodgers competed a short pass to Randall Cobb, who turned the play into a 26-yard gain. 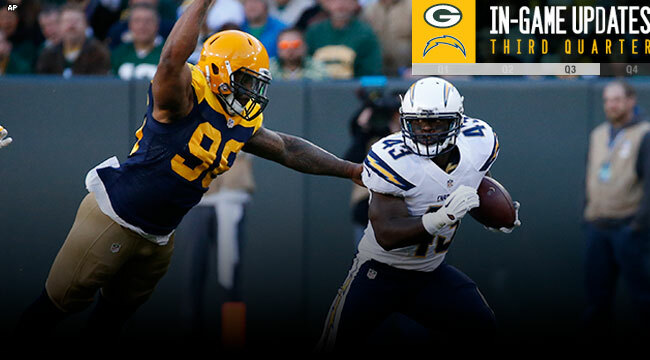 James Starks ripped off 7 yards and the Packers were in scoring territory. A beautifully conceived pass play to John Kuhn gained 19 yards to the 13. Starks plowed to the 8-yard line, and then Rodgers pitched a back-shoulder touchdown pass to James Jones.